The Easy-Bake. 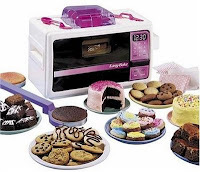 I always wanted an Easy-Bake Oven. But when you live in a house with a woman who finds it just as easy to turn on the big oven and whip up a cake, you don't get an Easy-Bake. And unfortunately, the Easy-Bake Oven will no longer be the same. Check out the latest news in this article. Don't despair. There are plenty of junk kitchen toys you can still buy, like the Dipping Dots machine. Now I understand why my momma never bought me an Easy-Bake Oven. Last weekend, Frick and I went to visit my momma (a.k.a. Mammy) who was keeping little Gertie. It was a quick visit of girl time. Frick and Gertie were able to play dolls and tea peacefully while Mammy allowed me quite time to read magazines, clip coupons, and sleep. It is always a mini-reprieve for me. It's nice to have some time to relax. Mammy doesn't relax while we are there, though. She is always bustling around, doing something. Funny, how that trait skipped me. While we there, she made pepperoni rolls for us. Frack had asked for them last time we there. Since he didn't come with us, she wanted to send some home to him. Here is the recipe that she uses. Dissolve the yeast in the warm water. Combine with the rest of the ingredients, beating with a mixer. Add 4 cups of additional flour. Add 1 more cup of flour until dough doesn't stick to hands. Take out of bowl and knead on a floured board. Grease bowl and let rise 1 hour and 15 minutes in a warm place. The only warm place in Mammy's house - next to the gas fireplace. Roll out into a large rectangle. Sprinkle with chopped pepperoni and mozzarella cheese. Roll up and seal edges. Place on baking pan and let rise for 1 hour. Bake at 350 degrees for about 25 minutes or until the edges turn brown. I wanted to whip up a snack for a group of teachers today. I needed a lot, it needed to be easy, and it needed to be made out of stuff I already had in the house. These homemade Cracker Jacks were perfect. The hardest part of this is separating the popped corn from the unpopped kernels. But with a little bribing, you can talk cute, little girls into helping. In a nonstick sauce pan, bring the corn syrup, butter, brown sugar, and salt to a boil, stirring constantly. Boil without stirring for 5 minutes. Remove from heat. Add vanilla and soda. Pour over popcorn and peanuts. Mix well. Spread on a cookie sheet and bake 250 degrees for 45 minutes. I once tried this with pecans. The pecans became too toasty and burned slightly. I left out the corn syrup yesterday in a batch, and it still came out okay. Use parchment paper on the cookie sheet for easier clean-up if you are using an old, cruddy pan. The caramel will slide off rather well on good cookie sheets. Spend some time with those friends this weekend who make your world pleasant. There is something about a man who knows his way around a kitchen. Now, I'm not talking about knowing how to crack open a can or pop something in the microwave. Most men can do that. I'm talking about a man who can separate an egg yolk from an egg white. A man who can chop an onion so swiftly he doesn't have time to cry. A man who can make a roux with one hand behind his back. Or how about a man who just knows what a roux is? Now, I don't think I personally know any of these type of men. I'm sure they are out there, I just haven't met them, yet. But my mom has met Bert. I'm not sure who Bert is. I only know that I found this recipe in my mom's recipe box. When I asked her about Bert, she rattled off his family tree and other assorted trivia, and then said this was his favorite cake recipe to make. I don't know Bert. Don't know if this is his own recipe or if he ripped it off the Internet somewhere. Really, I don't care, because I'm just glad Bert's in the kitchen making and sharing cakes. Beat the eggs, milk, oil, sugar, and flavorings together in large bowl. Stir in the flour, salt, and baking powder, stirring well. Stir in the coconut. Put in greased and floured Bundt pan in a cold oven. Bake at 350 degrees for 1 1/2 hours. Remove from pan immediately and cool on wire rack. If you are looking for a sweet tribute to love and hearts this Valentine's Day, you had better look somewhere else. I'm feeling a little jaded about love this year, maybe even a little bitter, maybe even a little hurt. And because I'm feeling this way, I can't help but think back to loves that were sweet but short,loves that were not meant to be, loves that broke my heart, loves that healed my heart, and loves that never left. Here is one of my favorite lost-love poems to share with you. But alas, if you are feeling like sharing some love with those you love, might I suggest these easy to make, last-minute treats. Crush cookies to fine crumbs in food processor. (Cookies can also be finely crushed in a resealable plastic bag using a rolling pin.) In a medium bowl, add cream cheese to the crushed cookies; mix until well blended. Do it with your hands. It is smooshy. It will feel great. If you are making it for people you don't really like, don't wash your hands first. Heck, lick your hands and roll out some more. Only you will know. Roll cookie mixture into 42 balls, about 1-inch in diameter; I have a small cookie scoop that I use. Place in refrigerator until firm, about 15 minutes. Dip balls in chocolate; place on wax paper-covered baking sheet. Sprinkle with sprinkles, chopped nuts, or drizzle with white chocolate. Refrigerate until firm, about 1 hour. Store covered in refrigerator. On a side note, if you received these from me, I did wash my hands. Uhmm....why have I not heard about this? I'm not into running but this would have some incentive for me. To raise money for the NC Children's Hospital, participants run two miles to the Krispy Kreme, eat a dozen donuts, then run the two miles back to the start. Hello? I so could eat a dozen Krispy Kremes. And Hello? I so could run two miles if I knew I was going to get a dozen Krispy Kremes. Maybe this is a new goal for 2012. Get in some exercise, support a good cause, and nosh on a dozen donuts. Sounds like a good plan to me. Who's with me? What food would you be willing to run two-miles for? I was sad to hear of Jack LaLanne's passing this past month. Many nights when I was up with hungry babies, I only had Jack LaLanne's infomercials to keep me company until the babies were asleep again. Even though I was intrigued, I never had an interest in buying Jack LaLanne's Power Juicer until Farmer Brown brought home some oranges. Three huge bags of oranges. On the Sunkist website, I found some great orange recipes to try and got out my old-fashioned juicer. It was just me and my arm power. It was a lot of work to get the dribble of juice that you needed. 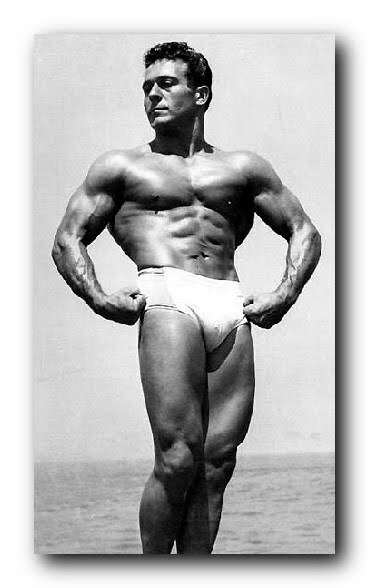 By the way, Jack LaLanne was not a big fan of sugar or processed foods. He would not approve of this recipe. Of course, that was his body. We won't post a picture of mine. Preheat oven to 350º F. Spread almonds in single layer on baking sheet. Toast 12 to 15 minutes in warm oven, until lightly browned. Gently shake pan from time to time. Cool and chop toasted almonds. Grate and juice oranges. Prepare cake mix according to package directions, substituting orange juice for water called for. Fold in grated orange peel, almond extract and 1/2 cup chopped almonds. Spoon batter into ungreased 10-inch tube pan. Sprinkle with remaining nuts. Bake and cool according to package directions. 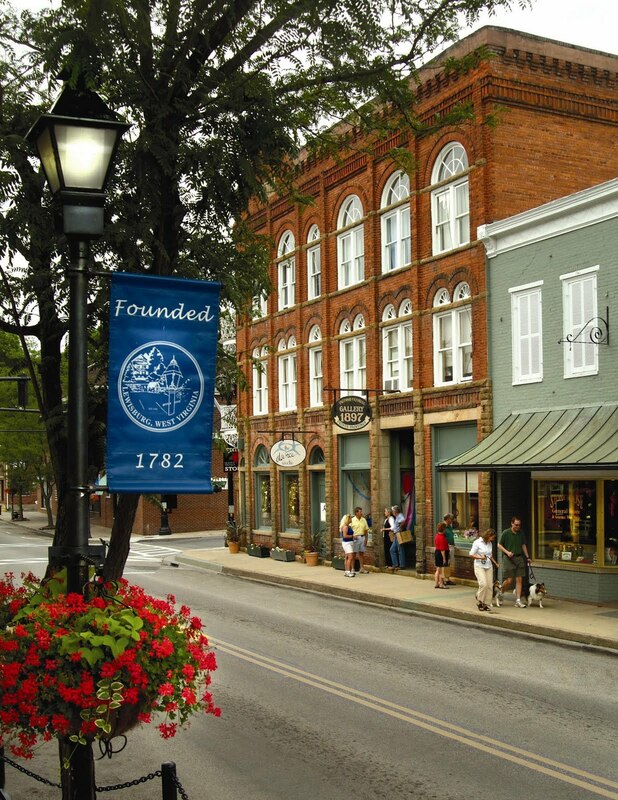 My little town Lewisburg, WV is currently in first place in Budget Travel's contest for America's Coolest Small Town. I agree it is the coolest town to live in, raise kids in, and visit. If you have a few minutes, click on the site and add Lewisburg to your ballot and vote. It's that easy. You can vote every five hours. We only have six more days to secure our title as America's Coolest Small Town. When we win the title, all of you are welcome to come and visit. Our town is full of amazing, locally-owned eateries, great shops, and beautiful scenery. Start planning your visit now. Also on the ballot is the town of Wiscasset, Maine. This fall, I attended an internship at The Center for Teaching and Learning in Edgecomb, Maine. I spent a fabulous week learning from Nancie Atwell. Ms. Atwell is to reading/writing instruction as Paula Deen is to butter. Soaking in all the information at the school was exhilarating and tiring. In the evenings, I only wanted to crash into bed, but how many times was I going to be in Maine? Each evening, I went out and explored the small towns along the coast. I stayed at Sheepscot Harbour Village and Resort which was centrally located to Boothbay Harbor, Darmiscotta, Rockland, and of course, Wiscasset which was just on the other side of the river. One of my favorite desserts was had at Sarah's Cafe. I had eaten dinner that evening at Le Garage, which was stupendous but still needed something for my sweet tooth. This Apple Pecan Upside-Down Pie was scrumptious. When I came home, I knew I had to make one in my kitchen. I found this recipe in my recipe folder, and it was pretty darn close to Sarah's pie. Preheat oven to 375 degrees. Stir together first three ingredients, and spread onto bottom of a 9" pie plate. Fit one crust over pecan mixture in pie plate, allowing excess crust to hang over sides. Stir together the apples and the next four ingredients. Spoon mixture into crust, packing tightly and mounding in center. Place remaining pie crust over filling; press both crusts together, fold edges under, and crimp. Place pie on an aluminum foil-lined jelly-roll pan. Cut 4 to 5 slits in top of pie for steam to escape. Bake in oven on lower rack 1 hour to 1 hour and 5 minutes or until juices are thick and bubbly, crust is golden brown, and apples are tender when pierced with a long wooden pick through slits in crust. Shield pie with aluminum foil after 50 minutes, if necessary, to prevent excessive browning. Cool on wire rack 10 minute. Place a serving plate over top of pie; invert pie onto serving plate. Remove pie plate, and replace any remaining pecans in pie plate on top of pie. Let cool completely.